Constructed of solid pine in a waxy brown finish, this desk with a two side drawers and a center pencil drawer provides storage and style to your home office. The low hutch offers two additional drawers, six small compartments/mail slots, a built-in power strip with two USB chargers and two outlets for your computer, phone, tablet, and other electronic devices. 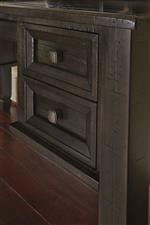 Tapered legs with a notched detail complete the look of this desk and hutch set. The Townser Solid Pine Home Office Desk & Hutch with Power Strip at Van Hill Furniture in the Grand Rapids, Holland, Zeeland area. Product availability may vary. Contact us for the most current availability on this product. H636-48 Home Office Desk Hutch 1 59" 10" 14"
H636-27 Home Office Desk 1 60" 27" 31"
The Townser collection is a great option if you are looking for Relaxed Vintage Transitional furniture in the Grand Rapids, Holland, Zeeland area. Browse other items in the Townser collection from Van Hill Furniture in the Grand Rapids, Holland, Zeeland area.